I'm sending out a BIG Thank You to Hobby Hill Farm and Tilly's Nest today! I won! I won! I won the Rise and Shine Travel mug from Hobby Hill Farm. by entering one of Tilly's Nest giveaways! This is the first giveaway I've won and it's great fun! I love the beautifully painted rooster on the mug and the charming decorative box it came packaged in! I'm sure I can find a use for it in the kitchen or pantry! Hobby Hill Farm offers affordable, decorative and fun FARM products for inside and out! Tilly's Nest is authored by my friend Melissa on Cape Cod where she shares her daily adventures of keeping a small flock of backyard chickens. She and her little flock are rising to the top as up and coming celebrities in blog land. They won Country Livings Blue Ribbon Blogger award last year! Visit both blogs and like their facebook pages! You'll be glad you did! Have a wonderful Monday friends!
" Rays and Waves "
Happy Saturday Dandelion House Friends! Can you tell what's on my mind today? Deb's planning new Cut Flower Gardens for both here and at the cottage and I'm dreaming of cleaning the boat and heading for open water! What are you dreaming up this glorious Saturday? 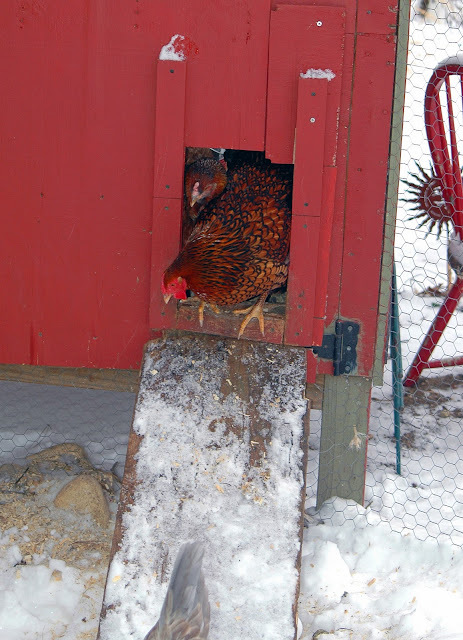 Welcome to Farmgirl Friday blog hop # 42! 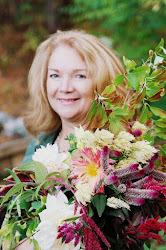 My co-hostess Heidi ( fellow famrgirl sister and author of the White Wolf Summit Farmgirl blog) and I would like to thank all of you for a great week of entries! We climbed up and over the 50 mark thanks to you! We welcome NEW BLOG SISTERS ALWAYS! 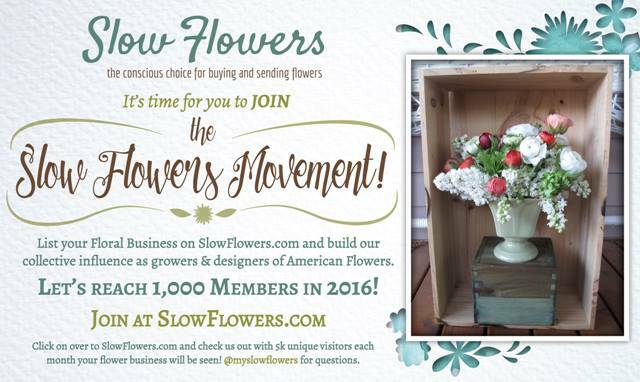 If you are new, to our blogs and the hop, don't be shy! Be sure to introduce yourself on your way out! 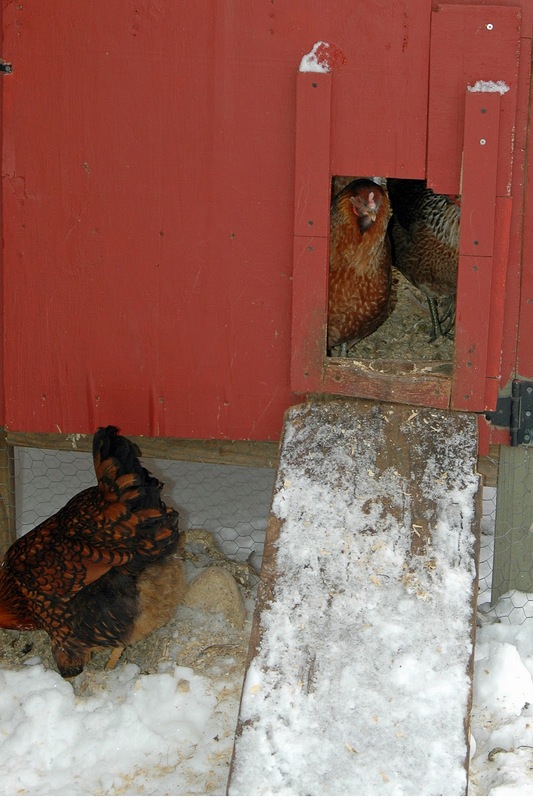 Warm weather and rain this week has all but washed away the snow that had the Cottage Hens in a dither last week. And, with a fresh bed of pine shavings in the coop and longer warm days, they are happy as can be. As for me, I've been reading up on growing and arranging cut flowers and planning more beds and the addition of a small hoop house in our yard, all of which I'll share with you very soon! Here's a sneak peak at what I'm looking at for our yard so I can extend the growing season on both ends. I would love to hear from any or all of you who are growing with hoop houses! I won't hold you up any longer! 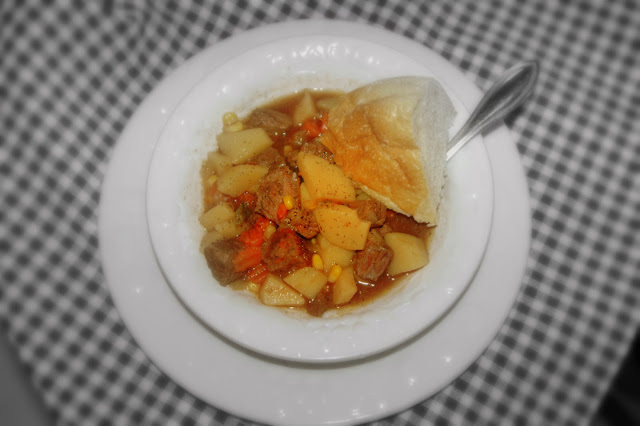 Go ahead and link up for your weekly dose of Farmgirl Soulfood!
" For the Farmgirl in all of us "
MaryJanesFarm news: MaryJane has a new page called girlgab.com! It's chock a block full of information on the Farmgirl Sisterhood and you can add your blog to the roster there! Welcome New Dandelion House blog sisters! So glad to have each and every one of you! If I missed someone, please introduce yourself in the comments section below! I'm a Pinner! DON'T save me! Oh my goodness! Do you PIN? I confess, I avoided it for a while even though I knew I was missing out on some amazing creative ideas, beautiful images and guaranteed inspiration. I finally caved in a couple of weeks ago and I've been pinning ever since! I'm dreaming in *pinterest* at night but don't save me! I love it! Here's my favorite pin this week from a really cool blog that blogs by color themes. This one is from hepsylone's RED! And for your gardening feet! 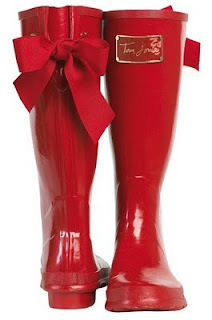 RED Wellies of course from moderncountrystyleblogspot. 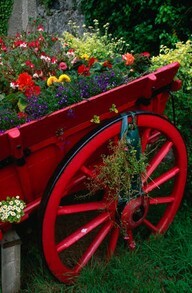 That's all for today folks, I HAVE to go find a RED wheelbarrow! I hope you have a RED LETTER DAY! Oh, and in all that spare time you have follow me on Pinterest too! I have a board devoted to my favorite color RED! Here a pin, there a pin, everywhere a pin pin... Do YOU pin? Plow and Hearth sells wooden planter wheelbarrows ready for any color you wish! Stevie the" rebel chick " was the first one out! I wasn't surprised. 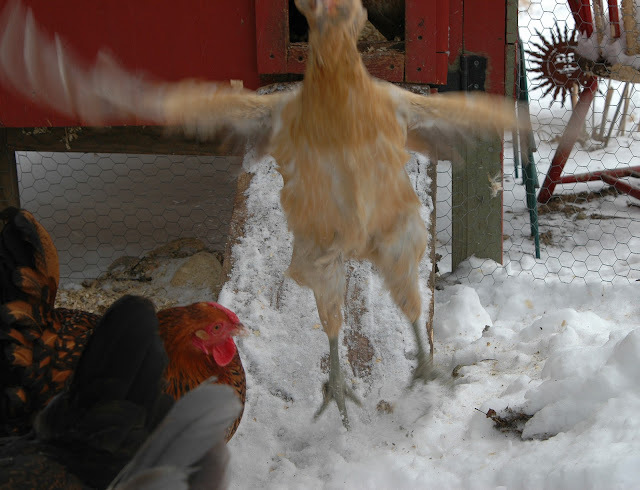 She was always escaping before we clipped her wings. Next up was Lucy. She was very curious but held this pose for a few minutes before deciding the coast was clear! After all, Stevie had survived all the way to the bottom of the ramp. Maybe it would be okay for her too? Finally she makes the leap! Penny and Gladys are waiting in the wings still thinkin' about it. Liza pushes her way forward and joins Gladys in scouting things out. Liza decides to make run for it! 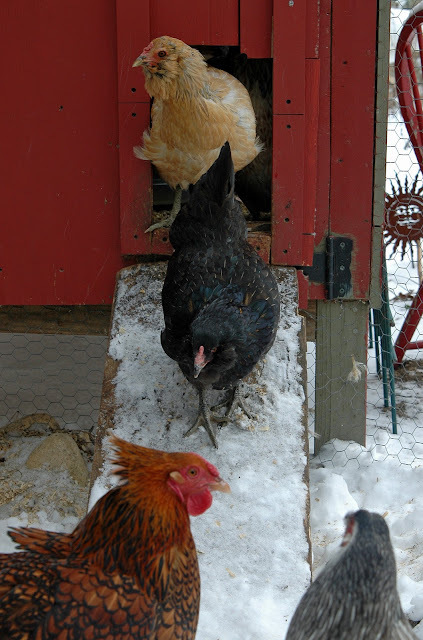 She's quickly followed by Blondie while Stevie and Lacy (who just fluffed her feathers to help cheer them on) wait at the bottom of the ramp. All the while, I'm still crouching, and calling to the girls in my best chicken voice... Here, chic chic chic... come on girls..... chic chic...here pretty girls.... chic chic chic...when suddenly I feel something hit the front of the camera then skim the top of my head! I'll give Blondie credit. That's one way to avoid the snow! I'm pretty sure these two are in cahoots! I'm not sure what they're planning but I know they're definitely up to no good! Liza's ( the brunette ) the more adventurous one. I think she might be trying to talk Lucy into getting a tattoo. I overheard her say, " nothing too flashy, just a little something around the ankle would be nice ". Gladys is working up some courage after watching the other girls. But, she never made the leap! 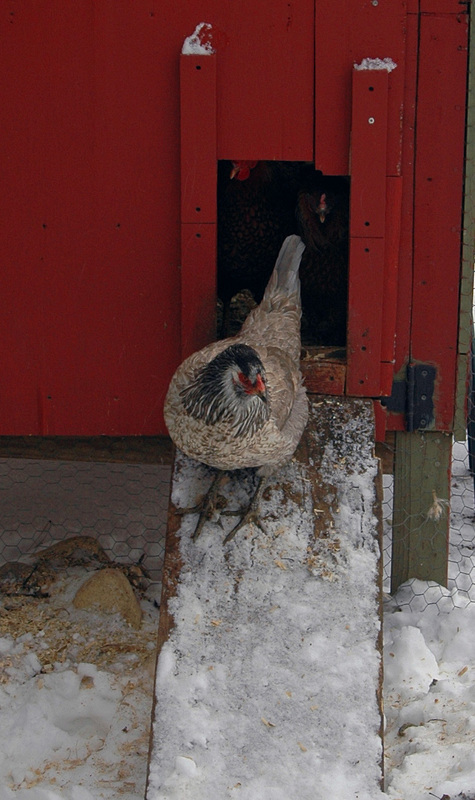 She stayed inside with the other " chickens "
Chestnut, Hazel, Lacy Lou, and Penny. Well, at least I know they aren't headed off to the nearest tattoo parlor! *The best thing to do for your girls ( and boys ) when it snows is to clear a path for them. If they can see some bare ground, they'll feel much more comfortable about coming out of the coop. Make sure you give them plenty of fresh water every day even in winter. 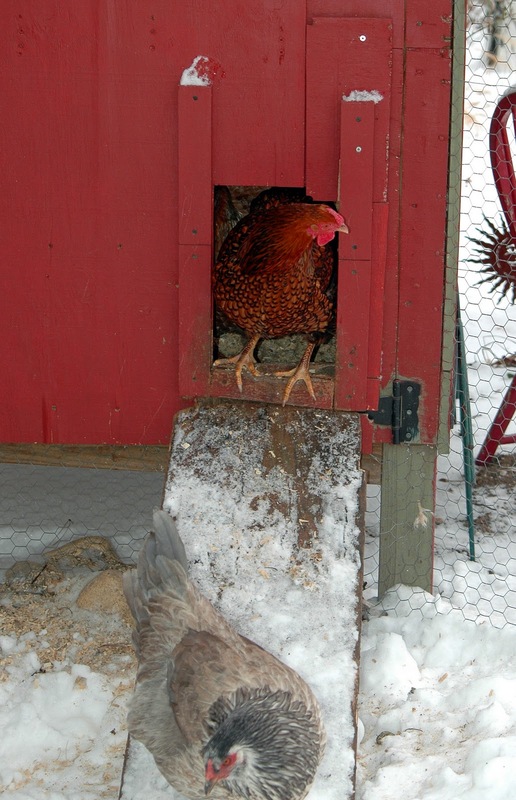 We've still not invested in a heater for our water feeder so I bring it out fresh every day. I don't mind. It just gives me another reason to go out for a visit and make sure they are all doing okay. 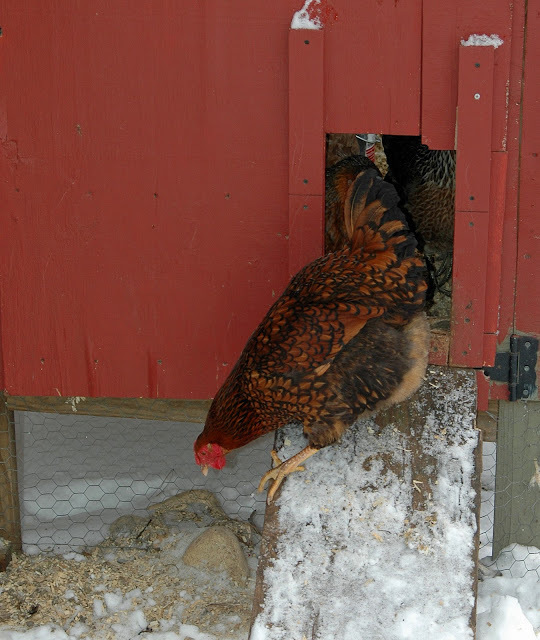 I also add more shavings to the coop for extra warmth during the colder months. Picked some up today! So, tell me. 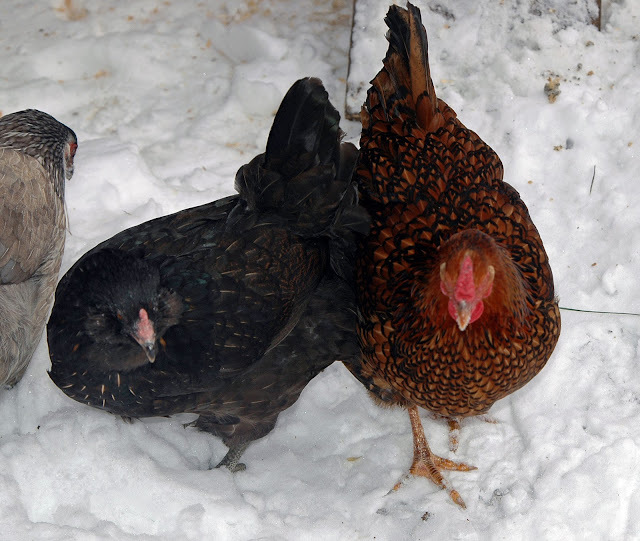 Are your chickens " chicken " too when it comes to snow? I'm off to dosado with the Barn Hop folks! PS. no human, chicken or camera was injured in the making of this post!
" Seaside Snow Fence "
Hello friends! Old man winter finally stopped long enough along the northeastern seaboard to leave us a little snow. How's the weather in your neck of the woods today? Howdy friends! My co-host Heidi of the darling blog White Wolf Summit Farmgirl and I want to welcome you back to your favorite Friday blog hop! 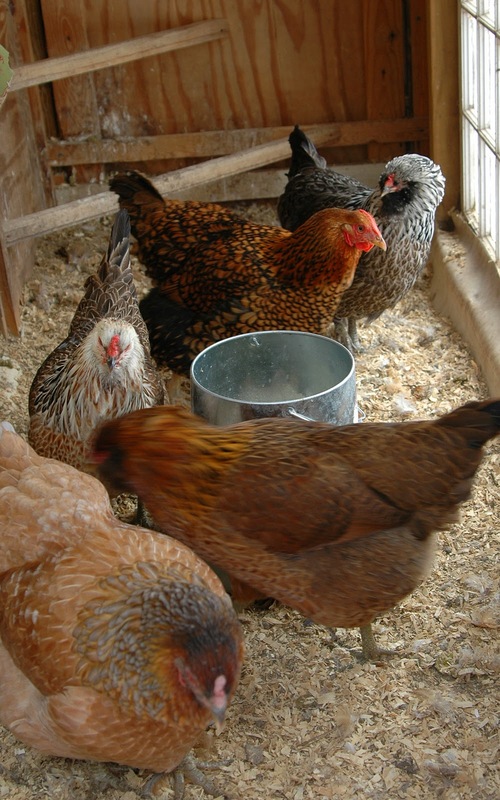 Farmgirl Friday has been going strong for 40 homemaking, homesteading and urban farming, farmgirl weeks! Who's farmMade? Here's what Patti Long, one of the talented team members of farmMade wants you to know! "FarmMade is a handmade marketplace for Farmers. We promote all things FARM....from the food that they grow, to the life that they lead, to the wares that they make. We intend on helping to sustain existing farms and grow new ones! 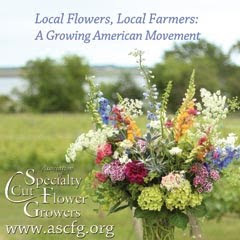 We celebrate the "new definition of the present day farmer" in recognizing the city farmer, rural farmer, rooftop csa, community gardens, back/front yard farming, container cultivation, etc. ANYONE who cultivates the land and/or owns livestock to feed themselves, sustain their families and connect to a healthier lifestyle is a HERO in our book." You can visit FarmMade on facebook and follow the stories of the farmers they profile each week. Click their link in my sidebar under sponsors and sign up for email notification for when their online marketplace will open or if you are interested in selling your " farmMade goods"! I don't know about you, but I can hardly wait! Now it's on with the hop! The new Sisterhood and Farmerette badges are up for 2012 over at MaryJaneFarm! This weeks MJF Beach farmgirl Blog entry is all about my recent date with my mom in " Playing House "! Oh, what a dream to have the luxury of all my baking supplies, small appliances, oils, canned goods, dry goods, table linens, and serving trays all with in reach of my kitchen/eating area. Smaller cottages and homes of yest- er-year didn't have large built-in pantries so homemaker's had to find ways to make do. 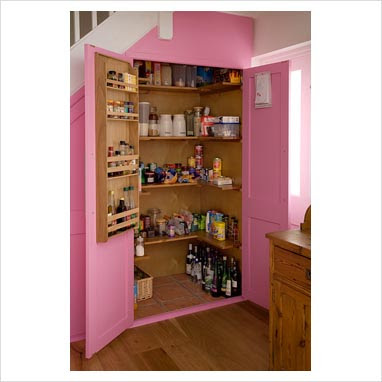 Hence, the unfitted kitchen concept. 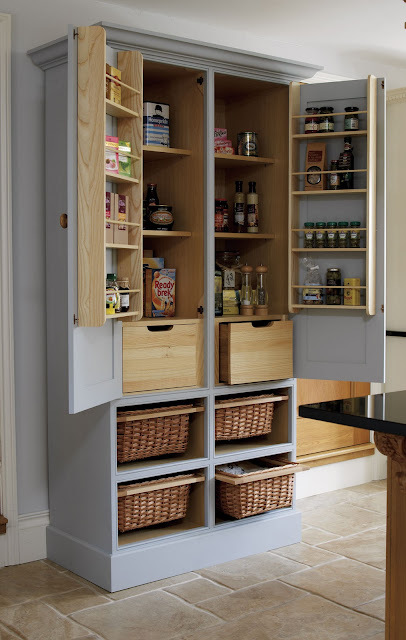 I've always loved the look of an unfitted kitchen and I've tried to achieve that by using a mix of antiques for various functions. A china cabinet as my faux butlers pantry, and an antique buffet as a place to store table linens, cutlery, and serving trays. These ideas have served me well over the years but it's time for a change! 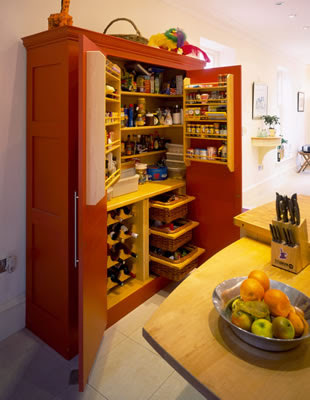 By the way, how do you like the lovely red larder in the top photo? Why not RED? 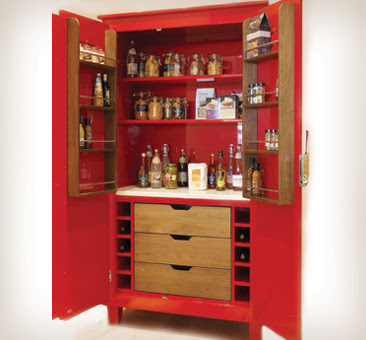 Red is a warm and inviting color in the Kitchen in just the right dose and its' cheery too! 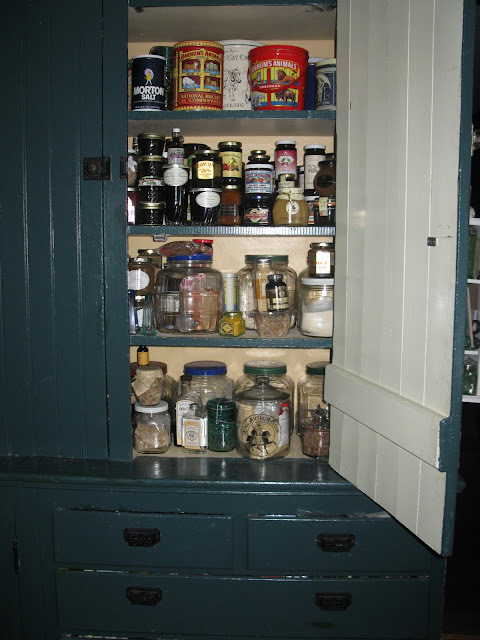 My days of crawling around on the floor for ingredients, pie plates, salad bowls, cooking oil, and canned goods that are stored in my lower kitchen cabinet ( yes, one cabinet ) are soon to be a faded memory! Let's just say, I have had my ah ha moment! No longer will I run to the basement or a far- away cabinet for a can of pasta sauce or jam. 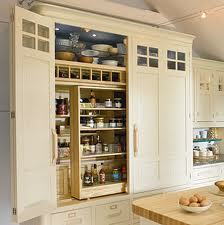 Soon I will be among the elite homemakers of homemakers with my very own Larder! 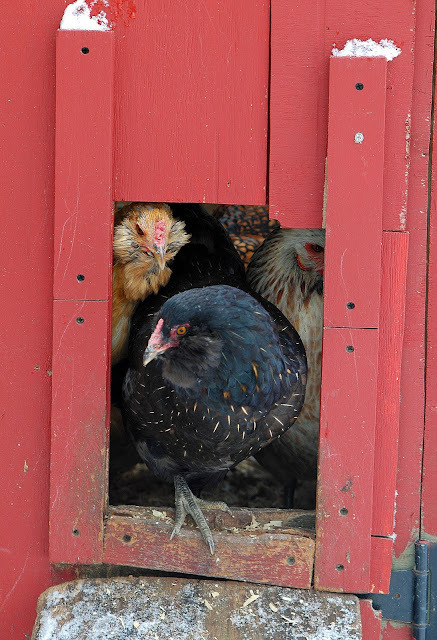 Oh now, don't get your tail feathers in a bunch... It's not as easy ( or as brilliant ) as it sounds... Ya see, I've got this out- dated Armour from Pottery Barn ( we call it the monster because it won't fit in any other room in the house ) we used to use for our TV and media storage. I thought I was being very clever when I asked Boz to take the top doors off so we could use it for book shelves and have a more open look in the living room.That was after I tried to give it away to friends, neighbors and sell it on Craig' s list. All the while I was fussing about not having enough food storage in the kitchen. 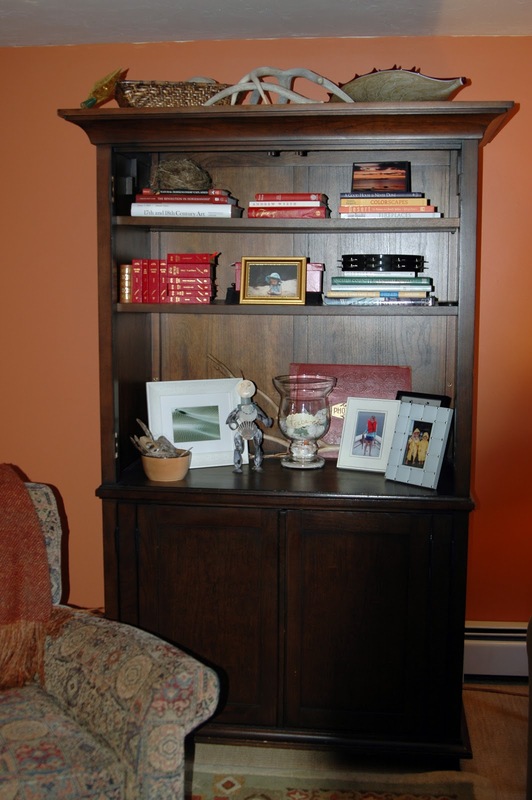 I realize now, in my efforts to get it out of living room ( in order to create shelves for our books collection ) I was being very hasty! What was I thinking? 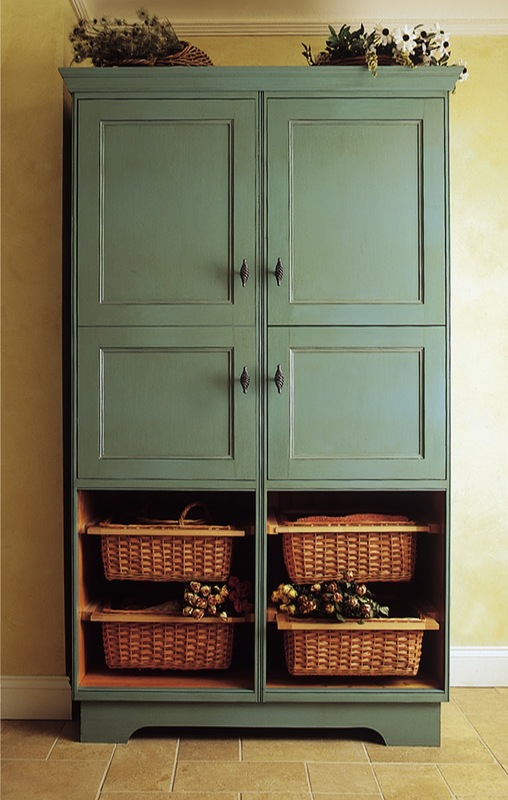 It's similar in shape to several of these pantry images (minus the pantry pullouts inside) and will fit perfectly where our buffet is now leaving space on either side for extra dining room chairs. It will need paint of course! Our kitchen has Beach White cabinets with two Black cabinets for an accent and our island is black too! The question is..... what color do I paint it? I was leaning towards the off white for a clean, fresh look, but Boz thinks Black would look nice too! Naturally, I'm entertaining red as an option as well. But, I'll probably come to my senses on that one...I just need to live with it in my head for a while before I let it go! This is a sneak peak of our island.. 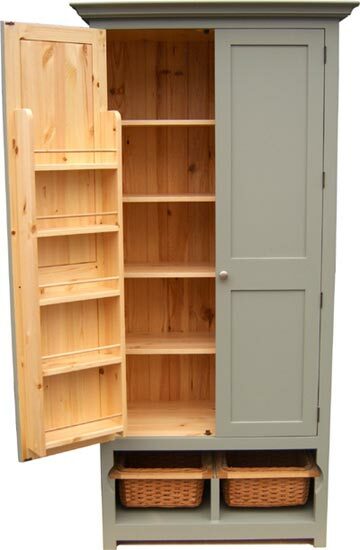 I love the storage for cook books and display items. The other side has drawers and enclosed lower cabinets. A farmers sink is another way to add more space to a kitchen with minimal counter space. We added one to our new kitchen last winter. I found it online here. Their cost was about half of the local Kitchen and Bath show room. It's great for filling pitchers, draining pasta and clearing the counters of cooking utensils while cooking. Our kitchen remodel is about complete. Except for floors and a new island top we are just about there! I plan to do a full reveal post so I can share more tips on ways to save money using reclaimed items and your creativity! Simplifying your life doesn't mean you have to settle for a bland color palette or do without the things you need to make your daily rounds easier and more efficient. Sometimes it's a good thing to hold on to something until you can think of a wonderful new use for it if you can't schlep it off on a friend or neighbor! Tip: Next time you think you NEED to get rid of something, look right under your nose first. You might already have something that would fit the bill! With a little or in some cases a lot of tweaking you'll be on your way to simplifying your home and fattening your wallet at the same time! I love to take things slow on the weekends if I can get away with it. And if I'm NOT moving slow, that's all the more reason to break out the crock pot for some slooooow cookin'! I love my new red model! It reminds me of my old convertible! Small, red and easy to operate! It looks fast but cooks nice and slow! What can I say, this is how I party these days! To break it in I decided to give it test run with my favorite Beef Stew recipe. It did not disappoint. 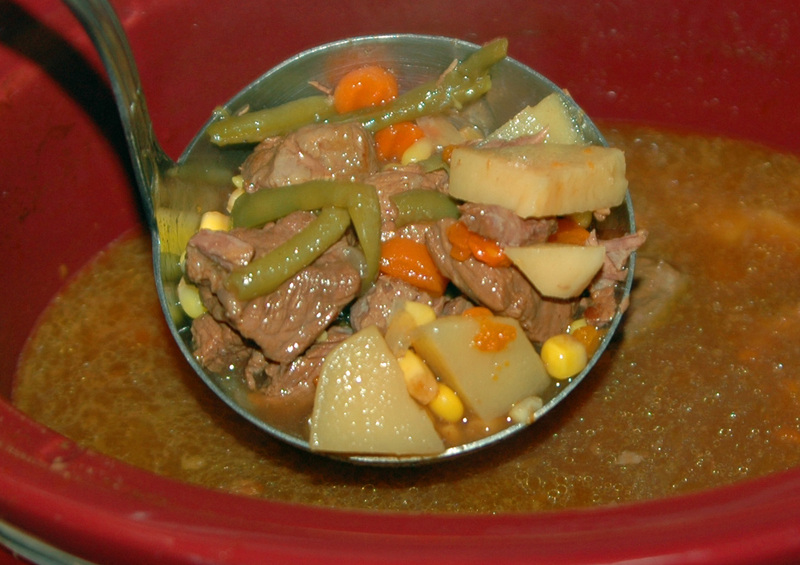 It brewed up a hot and hearty batch of Sloooow Beef Stew! Try a batch of your own! Directions: Add vegetable oil to a large on a medium heat setting. Season with salt and pepper and coat the beef in flour. Add meet and cook until browned. Add all other ingredients to your crock pot while meet is browning and set it on the highest setting. Add meat, close the lid and walk away for at least 6 hours. This recipe serves 6-8 people. Now you have the whole day to do what ever your heart desires. Put your feet up, read, blog, read, blog some more, eat chocolate, or go out to an afternoon movie! 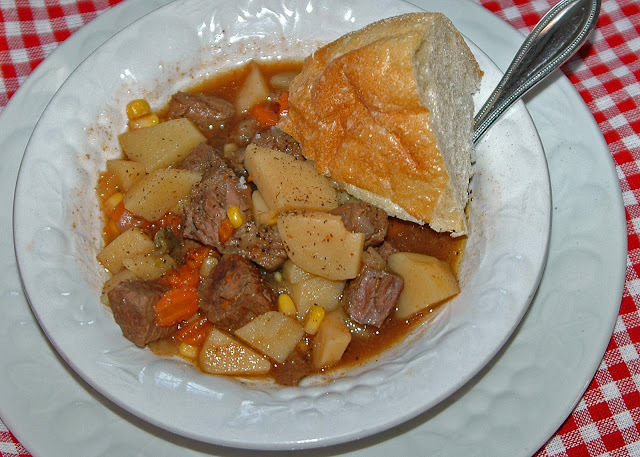 When you get home you'll have a yummy Sunday Stew waiting for you! Serve with warm bread ( homemade if you are feeling ambitious ) salt and pepper to taste and enjoy! *This recipe doesn't have celery or stewed tomatoes included. I love the added flavor of tomato juice though and it gives the broth an inviting, warm color! That's the great thing about stew, you can add or delete items to suit your own taste! 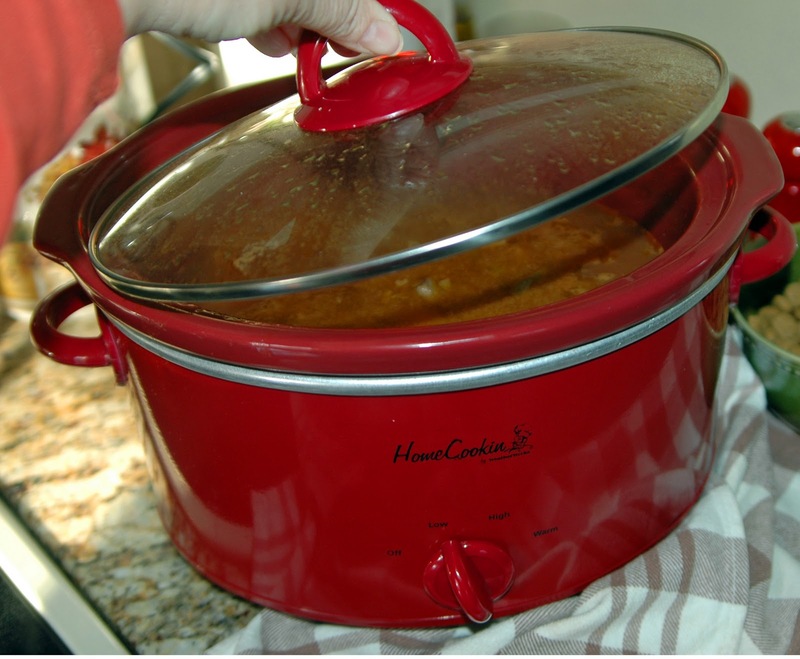 I'm linking this recipe to Heidi's Simple Country Living homemaking blog hop ! Happy Saturday Dandelion House friends! Old man winter finally blew in to New England yesterday after a very mild winter so far. 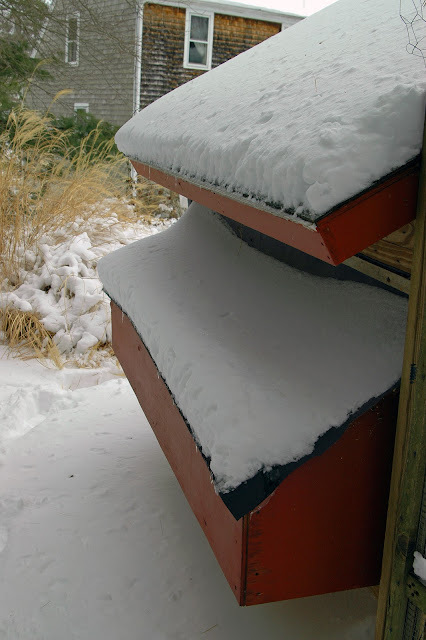 Last night we had high winds and below freezing temperatures. Sure makes boating season feel like a long time off! Deb's got a Saturday Stew brewin' in the crock pot today! Yum! Farmgirl Friday # 40 and NEW Co-host Heidi! 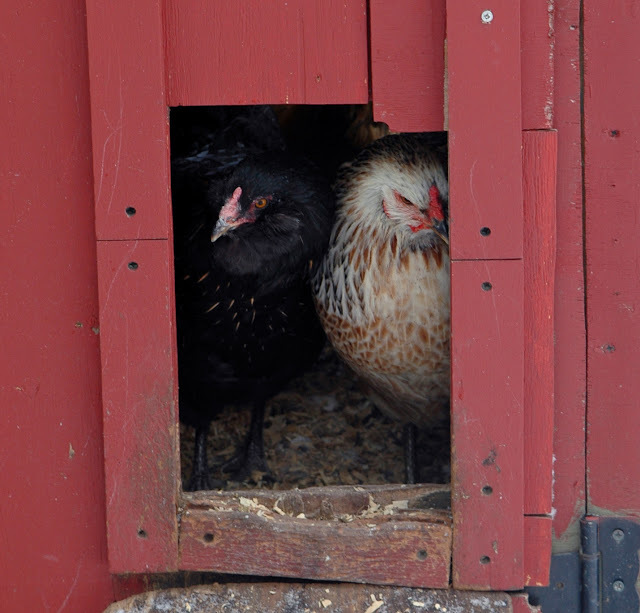 Welcome homemakers, homesteaders, rural, suburban, urban, city, cottage, and beach farmgirls everywhere! It's time to show and tell what you've been up to in your kitchen, sewing room, studio, potting shed, barn, home-school, and more! 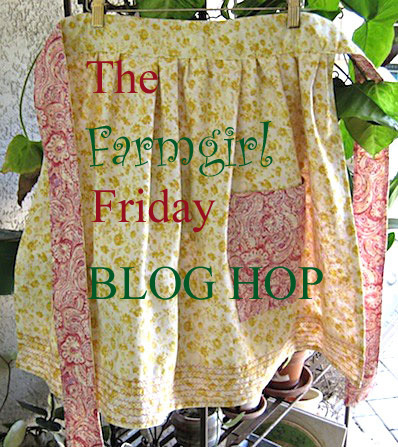 And, to make your weekly flaunt twice the fun, Heidi of My Simple Country Living blog will be my new Co-host for the Farmgirl Friday Blog Hop! Welcome Heidi!!! I am honored to have her!!! White Wolf Summit Farmgirls!? It's adorable! 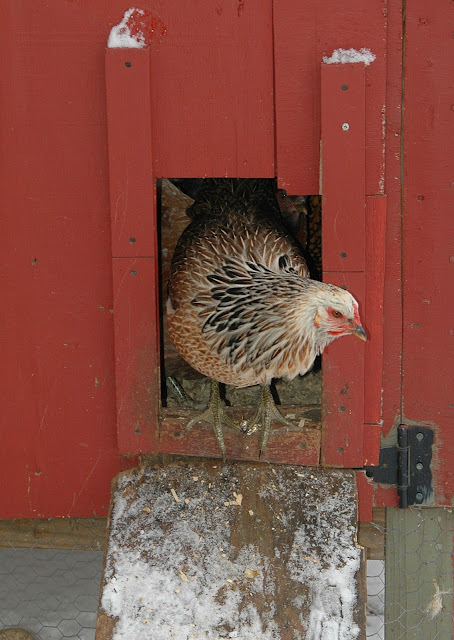 Go see here, click that follow button and give her a warm" farmgirl " welcome! Sister Dolly of Hibiscus House has a new cooking blog! Dolly is Cooking. Dandelion House now welcomes Sponsors! Visit my Sponsorship page for more info on how you can participate!